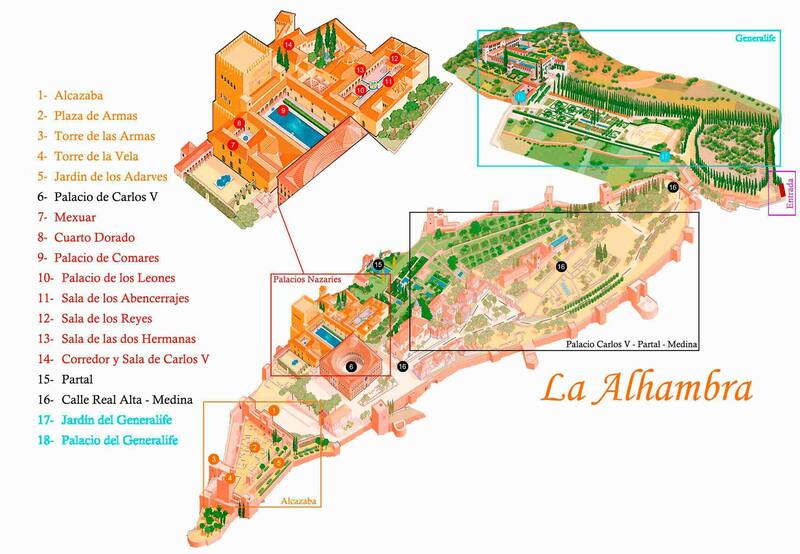 The history of the Alhambra is linked with the geographical place where it is located: Granada. On a rocky hill that is difficult to access, on the banks of the River Darro, protected by mountains and surrounded by woods, among the oldest quarters in the city, the Alhambra rises up like an imposing castle with reddish tones in its ramparts that prevent the outside world from seeing the delicate beauty they enclose. Originally designed as a military area, the Alhambra became the residence of royalty and of the court of Granada in the middle of the thirteenth century, after the establishment of the Nasrid kingdom and the construction of the first palace, by the founder king Mohammed ibn Yusuf ben Nasr, better known as Alhamar. Throughout the thirteenth, fourteenth and fifteenth centuries, the fortress became a citadel with high ramparts and defensive towers, which house two main areas: the military area, or Alcazaba, the barracks of the royal guard, and the medina or court city, the location of the famous Nasrid Palaces and the remains of the houses of noblemen and plebeians who lived there. 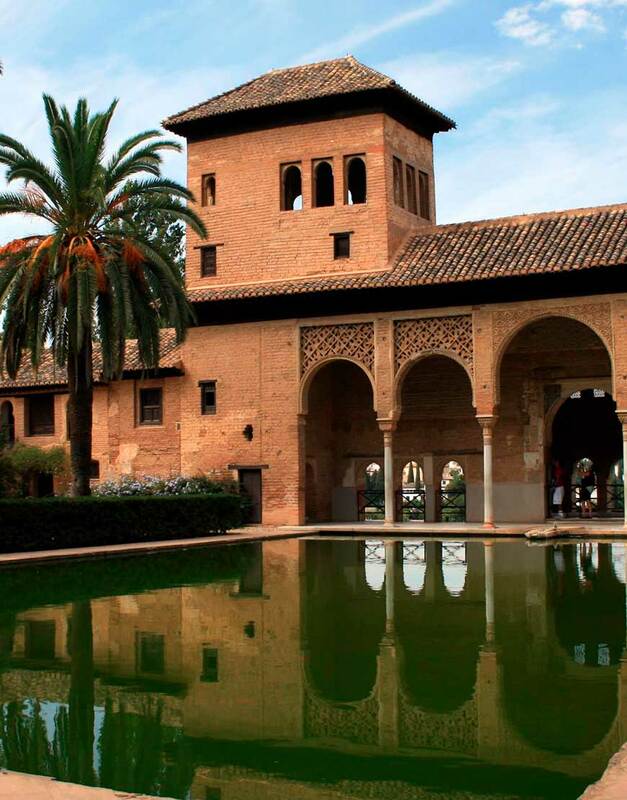 The Charles V Palace (which was built after the city was taken by the Catholic Monarchs in 1492) is also in the medina. 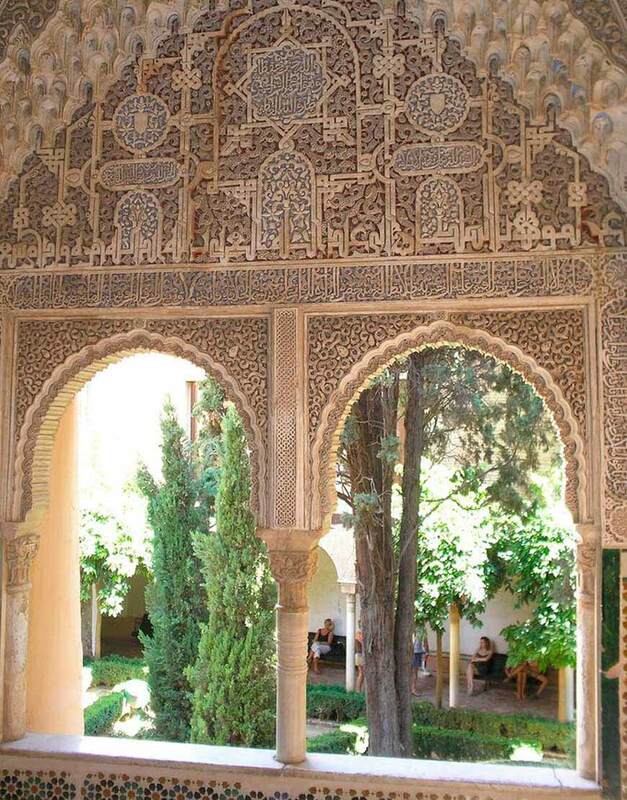 The complex of monuments also has an independent palace opposite the Alhambra, surrounded by orchards and gardens, which was where the Granadine kings relaxed: the Generalife. 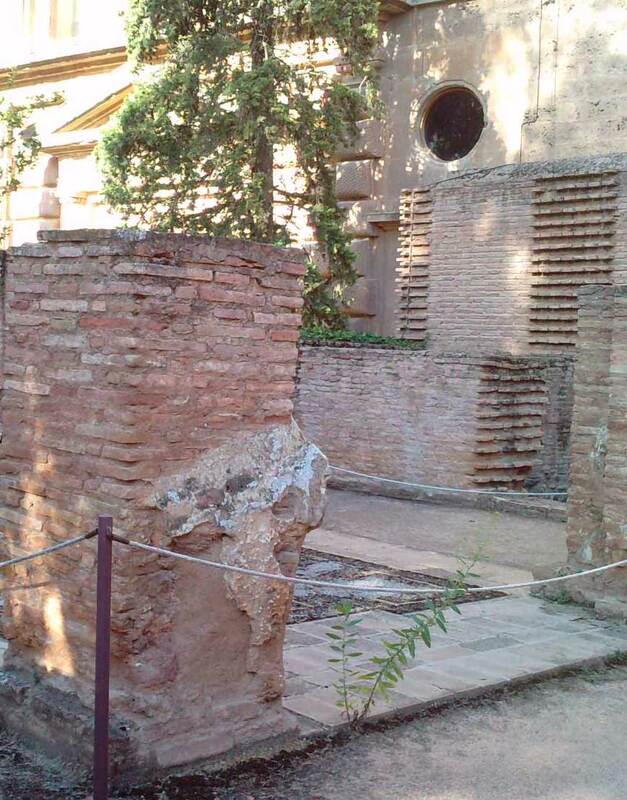 This is one of the emperor's projects for the city of Granada. 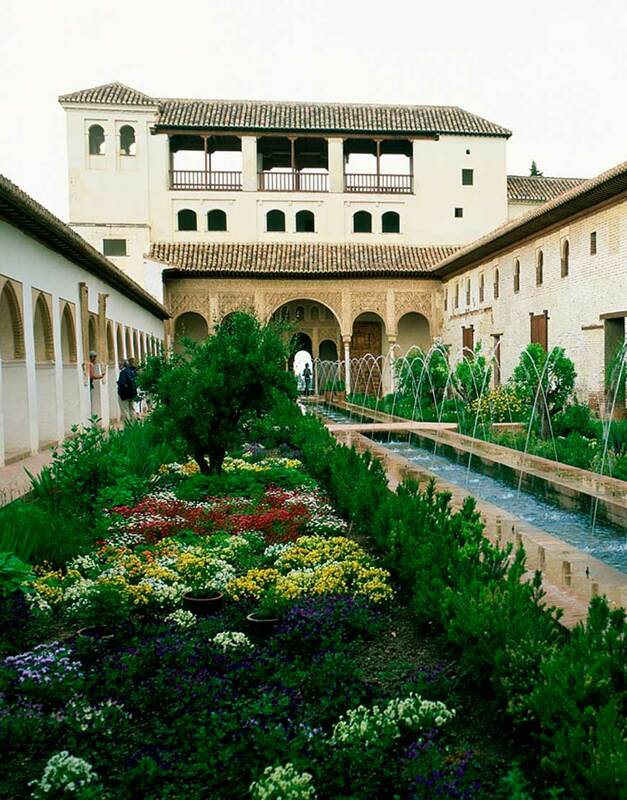 The choice of the Alhambra for its construction shows the king's awareness of the beauty of the Arab palaces and his interest in preserving them for posterity. The construction of the palace, which was started in 1533, was abandoned years later, as the kings had lost interest and the Court was already fully established in Madrid. 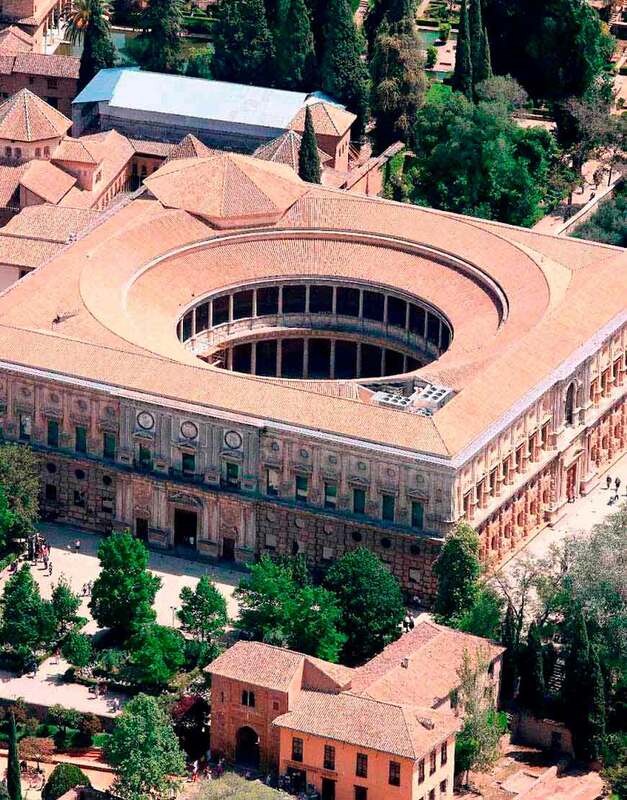 It was at the end of the twentieth century when the building's roofing was put in place and the museums were fitted out inside, the Fine Arts Museum on the top floor and the Alhambra Museum on the ground floor. The citadel had several public baths, ovens, workshops, silos and cisterns and, of course, the houses of top government officials, employees and court servants. As a result of the war of Independence, the buildings were left in ruins and part of the rampart and its towers had to be reconstructed almost completely. 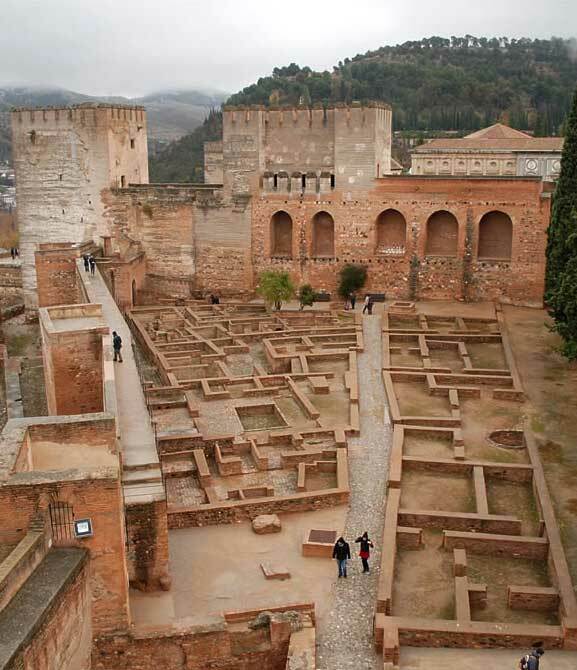 Visitors can see the foundations of the constructions, as well as the rampart from inside, with the parapet walks, battlements and merlons and a great view of the Generalife from the eastern part. Royal cemetery. The privileged garden where the mortal remains of the Granadine princes rested is visited just as you come out of the Nasrid Palaces. It is between the latter and the Charles V Palace. This area was restored recently, adapting it for visitors and emphasising its original structure. Complex of palaces, the residence of the kings of Granada. Its construction was started by the founder of the dynasty, Alhamar, in the thirteenth century, although the buildings that have survived to our time date mainly from the fourteenth century. The walls of these palaces enclose the refinement and the delicateness of the last Hispano-Arab governors of Al Andalus, the Nasrids. Three palaces form these premises: The Mexuar, The Comares, or Yusuf I Palace and The Palace of the Lions, or of Mohammed V.
Generalife Leisure villa of the sultans of Granada, surrounded by orchards and gardens, the latter created recently, together with the amphitheatre at the entrance, which every year is the setting for some of the shows of the Music and Dance Festival. The name, of doubtful origin, seems to come from the Arabic Yanat- al- Arif or Garden of the Architect, in a clear poetical-religious symbolism that refers to God, Allah, as an architect, the creator of the universe. It is worthwhile climbing the Water Staircase, especially in summer, to let the clear, cold water, which runs down the banisters, slip through your fingers. La Alcazaba The fortified military complex. The first Arab constructions date from the Caliph period, possibly on the remains of a Roman fortification. 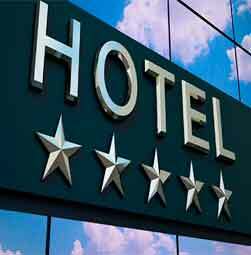 Nevertheless, the main constructions date from the Nasrid period, the thirteenth to fifteenth centuries. The complex also includes some Christian additions, such as the round Torre del Cubo [Cube Tower].